A born and bred London marketer who loves being creative. Currently works in the Marketing team at BookingBug and can usually be found listening to music and moaning about Arsenal. In this series we’ll be exploring the challenges the banking sector faces in creating a cohesive customer experience and the best ways to adopt an omnichannel approach. The term “omnichannel” may seem like a buzzword, but it refers to a significant shift in customer expectations, whereby companies seek to provide a seamless experience for their customers, regardless of the channel or device used to communicate with the organisation. In recent years, banks have significantly fallen behind other sectors in customer service satisfaction scores. In a 2015 study, Transform UK found that only three of eleven high street banks offered appointment booking capabilities online, and only four offered any digital integration in branch. The banking sector have worked hard to maintain a cohesive experience across channels by ensuring the same look and feel, whether that be in branch, through call centres, on the website, or via an app. Although these components are a priority, customer expectations have risen beyond the look and feel of a brand, and they expect a personalised customer journey that transfers effortlessly between all channels. Other sectors are beginning to understand the importance of the omnichannel approach. For example, Trainline have introduced mobile tickets that are instantly sent to your phone upon purchase. Customers can now keep all of their ticket information and travel details in one secure place and will never have the stress of queuing at ticket machines in rush hour again. We are now seeing banks starting to make changes to the customer journey across all channels. A great example of this is the online appointment booking by the likes of sector leaders in customer service NatWest, and Barclays Digital Eagles, who help customers get to grips with digital platforms in branch. Shifting customer expectations are putting pressure on banks to improve the customer journey even further, and although the leading banks acknowledge that omnichannel needs to reach the standards of brands like Starbucks - with their rewards app, and Disney’s MyMagic+ platform - they are still trying to work out how it can best apply to the banking sector. The purpose of omnichannel banking is to give customers a seamless customer journey; from comparing products online; to booking an appointment; to digital signage in branch and using mobile banking to check their account. Banks should look towards the most sophisticated retailers who are ensuring their marketing strategies are enabling customers to convert on any channel. Why? Because they’re now realising that shoppers who buy in-store and online are their most valuable customer. A 2015 study by IDC, found that omnichannel shoppers have a 30% higher lifetime value than those who shop using one channel. So the benefit for banks could be just as great. Not only giving a clearer understanding of their individual customers digital and physical touchpoints, but increasing revenue through the omnichannel customer. By adopting the omnichannel approach, the banking sector will be able to align the physical and digital touchpoints to improve the customer journey. 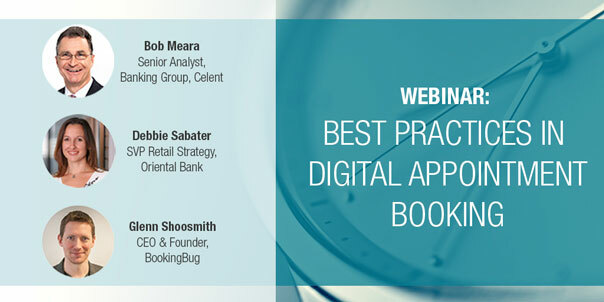 In this webinar, Celent analyst Bob Meara offers a primer on digital appointment booking, including best practice suggestions based on research among the early innovators. You'll also have the chance to hear from Oriental Bank, who will share their perspectives on what drove the decision to implement Digital Appointment Booking technology and what success looks like. Register now and book your place.